2544 Chasma Drive. Welcome to this desirable Franklin model on a premium elevated lot within the 55+ age restricted community of Solera. This Franklin model consists of 1768 square feet to create a comfortable living environment. You will be amazed by the gorgeous curb appeal composed of manicured landscapes and accent lighting. There is an inviting courtyard with gate leading to a beautiful iron screened entry door. Step through the front door and notice the sight lines to the windows framing the beautiful rear yard. You will fall in love with this elegant yet comfortable home comprised of a family room, dining room, and three bedrooms. Open concept living enhanced with nine-foot ceilings as well as bright windows allowing natural light to pour in. Kitchen and family room flow perfectly creating an ideal space for entertaining or relaxing. Kitchen is absolutely stunning and features quality cabinetry with pull out shelves, breakfast bar, granite counters, reverse osmosis, pantry, and upgraded appliances. Master suite promotes a restful feeling and offers views to the rear yard and a mega closet large enough for flexibility. Home is well appointed featuring designer characteristics and fine finishes throughout such as stone pattern tile, plush carpet, two tone paint, hand textured walls, ceiling fans, and plantation shutters. 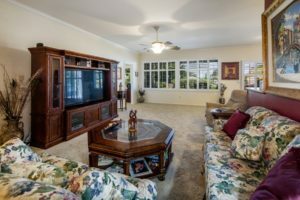 Convenience items and extras include new AC unit, New furnace, tankless water heater, Low-E windows, and solar screens. Peaceful year yard is complemented by twenty-five-foot covered patio with ceiling fan and views to the beautifully landscaped yard. You will be impressed by the quality and beauty of this home as well as the spectacular Solera location.